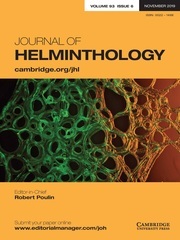 Journal of Helminthology publishes original papers and review articles on all aspects of pure and applied helminthology, particularly those helminth parasites of environmental health, medical or veterinary importance. Research papers on helminths in wildlife hosts, including plant and insect parasites, are also published along with taxonomic papers contributing to the systematics of a group. The journal will be of interest to academics and researchers involved in the fields of human and veterinary parasitology, public health, microbiology, ecology and biochemistry.